Due to its medicinal properties of aloe and honey since ancient times valued in folk medicine. With their use it is possible to prepare medicines from various diseases. Use only the lower leaves of the aloe for the preparation of various medicines. Choose the leaves with the dried tip. Do not store the picked leaf outdoors more than 3-4 hours, otherwise he will lose many useful properties. Squeeze the aloe juice with a juicer or by hand with gauze. Some recipes may require the aloe Vera juice with pulp, to obtain the necessary mass scroll through the aloe leaf through a meat grinder. Make a laxative drug for this recipe. Tear the leaves of the aloe, put on a few days in the fridge. Then squeeze out the juice and mix with honey in the ratio 1:1. If necessary, take this medicine on an empty stomach for 4 tablespoons for two days. Prepare medication for the treatment of inflammatory diseases of the pharynx, throat and trachea on this recipe. Mix honey and aloe juice in a ratio of 1:5. The resulting mixture is taken before meals, 1 teaspoon 3 times a day. The course of treatment is 1-2 months. Prepare this medication in small amounts, because it is better to use it freshly prepared. Sometimes to prepare the medication except for aloe and honey requires additional ingredients. Please note the cure for detoxification of the body. Take 1 kg of aloe leaves, chop them, add 1 kg honey and 1 kg of butter. The resulting mixture is put on fire, bring to boil and cook in a water bath for 20 minutes. Take half an hour before meals 3 times a day for 1 teaspoon, washed down with milk. It is necessary to consume all the mixture in one treatment. Bronchitis, colds, chronic diseases of stomach, gall bladder or liver use a drug made by the following recipe. Grind 0.5 kg of aloe leaves, add ¾ Cup honey and store in a dark place for three days. Then add 750 ml of red wine and leave for another two days. Take 1 tablespoon 3 times daily before meals. This medication is also used as a tonic. 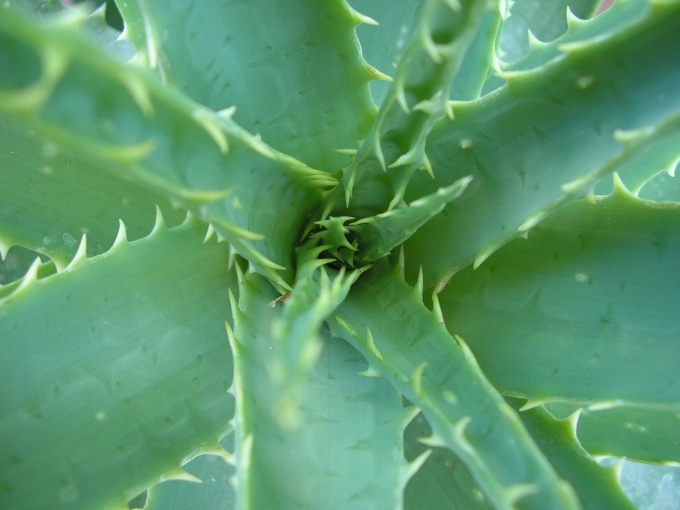 Remember that for people with diseases accompanied by bleeding, the use of aloe is contraindicated. For the preparation of drugs apply the aloe leaves with a length of at least 15 cm.